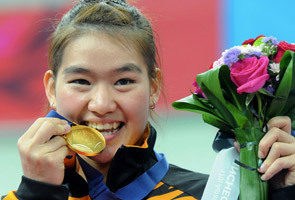 Tai was found to have taken the stimulant sibutramine, the Olympic Council of Asia said in a statement. KUALA LUMPUR: Youth and Sports Minister Khairy Jamaluddin said Malaysia will be appealing against wushu gold medalist disqualification from the Asian games for failing dope test. He also raised doubts on the integrity of the dope testing process, questioning why it took 16 hours for Tai Cheau Xuen's urine sample to reach the Doping Control Command Centre. Tai, who won the country’s first gold, tested positive after winning the Chinese martial art's women's nanquan and nandao all-round event. Khairy in a statement today said there were also no records to show that the sample was kept refrigerated. "There was also no date recorded and this raises the question over the sample's chain of custody,” he said in the statement. "The competitor has been disqualified from the competition as well as these Games, and as such her accreditation cancelled and her medal withdrawn," said the statement. The official announcement of the failed test was delayed because Tai and the Malaysian Olympic Committee had asked for the B-sample to be examined, officials said. A Tajik footballer, Khurshed Beknazarov, and a Cambodian soft tennis player have already been expelled for failing tests. Nineteen-year-old Cambodia Yi Sophany was also found to have taken sibutramine, which is widely used as a dietary supplement to control weight. About 1,900 doping tests will be carried out on the Asian Games athletes, according to the OCA medical committee chairman M. Jegathesan.